The artistic and contrasting combination of bright orange Gerberas intermingled with creamy white Asiatic Lilies will appeal to a diverse range of people; perhaps especially to those with colourful personality. 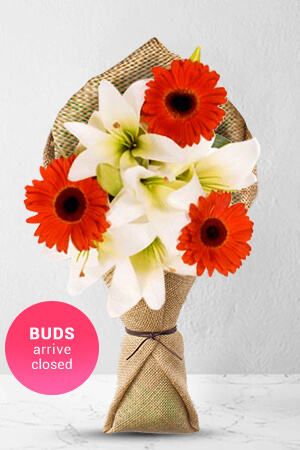 Send a this spectacular bouquet to your outgoing friends and family members for a sure-fire success.Lilies may be sent closed/partially closed in order to prevent damage and to last longer.Vase not included however; we recommend adding a Standard Vase to your gift to leave a lasting impression. Easy web site to navigate and great display of available purchases. No fuss and received an email advising flowers had been delivered. I placed a same day delivery order quite close to the cut off time and it was delivered very promptly. Excellent service.